Be the first to share your favorite memory, photo or story of Wayne. This memorial page is dedicated for family, friends and future generations to celebrate the life of their loved one. 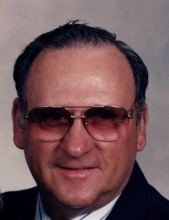 Wayne E. Boore, 84, of Girard, passed away at 4:00 A.M., Wednesday, March 27, 2019 at his home, surrounded by his family. He was born July 12, 1934 in Crawford County, Kansas, a son of Theodore and Gladys Fern (Geier) Boore. Wayne grew up in the Girard and Farlington areas and graduated from Girard High School. On December 18, 1954, Wayne was united in marriage to Joan Garrett at the Mt. Olive Missionary Baptist Church at rural Girard. She survives of the home. Wayne was a lifelong farmer and stockman at rural Farington and he enjoyed spending time with his family; hunting, fishing, and wood working; sharing his sense of humor and pulling pranks on others. Wayne was a member of the Mount Olive Missionary Baptist Church of rural Girard, where he was ordained as a deacon. Survivors, in addition to his wife, Joan, of the home, are his daughters and their families, Janice and Carter Moore of Katy, Texas, Emily, John, Maddy Merritt, and David Moore; Cheryl and Kent Copenhaver of Girard, Heather and Lance Sander, Corey and Annie Robinson, Nicholas and Bobbi Copenhaver, Neal and Lauren Copenhaver, Sarah Copenhaver, Jeremy, Shaylene, Erika, and Dee Dee Copenhaver; Marsha and Marty Werner of Liberal, Missouri, Michael and Melissa Werner and Monica and Matt McKee; his great-grandchildren, Maddy, Damon, Colby, Ryan, Hannah, River, Hunter, Tucker, Damien, Arianna, Zeke, Ja’ Kari, Michael, John, Maddon, Maelee, Kamden, Mathis, and baby to be; a brother, Marvin Boore of Girard; his sister, Freda Hardister of Pittsburg. Wayne was preceded in death by a brother, Edward Boore. Private graveside services will be held at the Girard Cemetery with Brother Tom Lewis officiating. A Celebration of Life service will be at 11:00 a.m., Saturday, March 30 at Mt. Olive Missionary Baptist Church followed by a luncheon. Friends may call after 2:00 p.m., Thursday at the Smith-Carson-Wall Funeral Home in Girard. Memorials are suggested to Harry Hynes Memorial Hospice, 3106 Main Street, Parsons, Kansas 67357 or Mt. Olive Missionary Baptist Church,, 230 E 590th Avenue, Girard, Kansas 66743. Memorials can also be left at or mailed to the Smith-Carson-Wall funeral Home, 518 W. St. John, P.O. Box 258, Girard, Kansas 66743. To send flowers or a remembrance gift to the family of Wayne E. Boore, please visit our Tribute Store. "Email Address" would like to share the life celebration of Wayne E. Boore. Click on the "link" to go to share a favorite memory or leave a condolence message for the family.